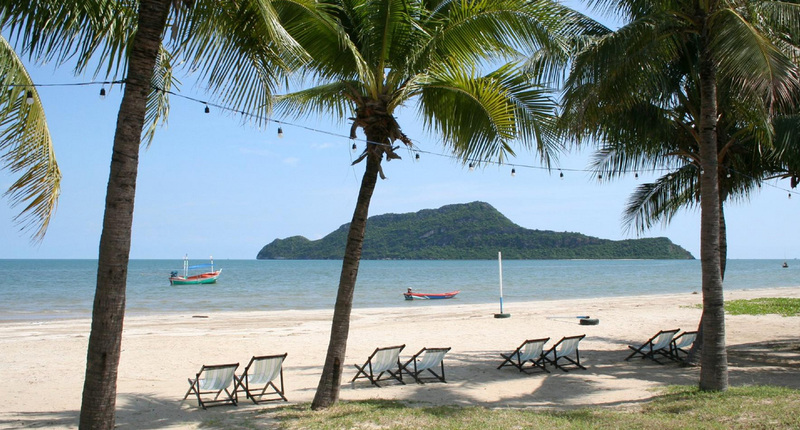 UNDER 792 HOTELS IN AND AROUND HUA HIN. 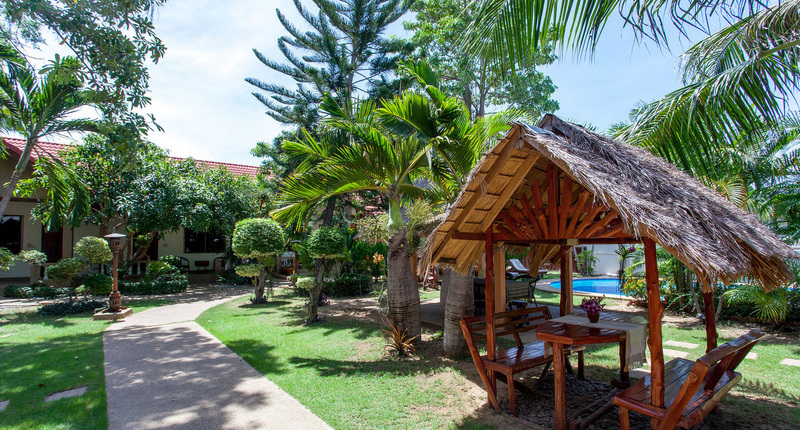 "Your luxury Boutique Beach Hotel"
As your Thai-Dutch hosts, we welcome you to our Luxury Boutique Beach Hotel nestled in between the mountains of Sam Roi Yot National Park and the beach of Dolphin Bay, just a pleasant drive south from Hua Hin close to Pranburi. Our Beach Resort offers you an escape from big city life and an enjoyable atmosphere that only a small Luxury Hotel can offer. The five kilometer long beach at Dolphin Bay is only a one minute walk down our lane. We speak Thai, English, German and Dutch. Escape to natural surroundings, rejuvenate your spirits and relax in peace and privacy. 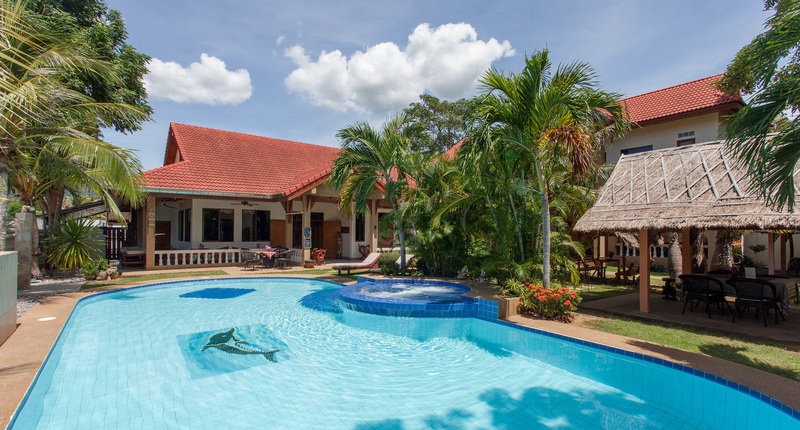 Enjoy our well maintained tropical gardens. Count the hundreds of orchids or take a dive in our beautiful swimmingpool with jacuzzi-spa. Have breakfast, lunch or dinner in our garden or just a drink at the bar. 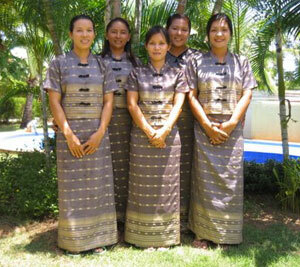 The Long Beach Restaurant offers you a delicious first class International and Thai cuisine. Feel yourself at home in one of our Thai style rooms. At "Longbeach Inn", you will experience our "homey" atmosphere and a friendly attitude. Your pets are very welcome at Long Beach Inn and of course we have free WiFi in all the rooms. We are catering to those who appreciate simple elegance and a personalized touch. We arrange transfer from and to the Bangkok International Airport or any other location in Thailand. Car The easiest way to travel from the airport or any other place in Thailand to Long Beach Inn is by car (taxi). Train The train from Bangkok to Hua Hin or Pranburi is rather slow and not very reliable. Bus Air conditioned buses (blue) leave Bangkok daily every hour, from 4.00 AM to 10.20 PM. In Bangkok, take a taxi to the southern bus station, Sai Dtai. Buy a ticket to Pranburi for around 150 baht. The trip takes approximately 3.5 hours. 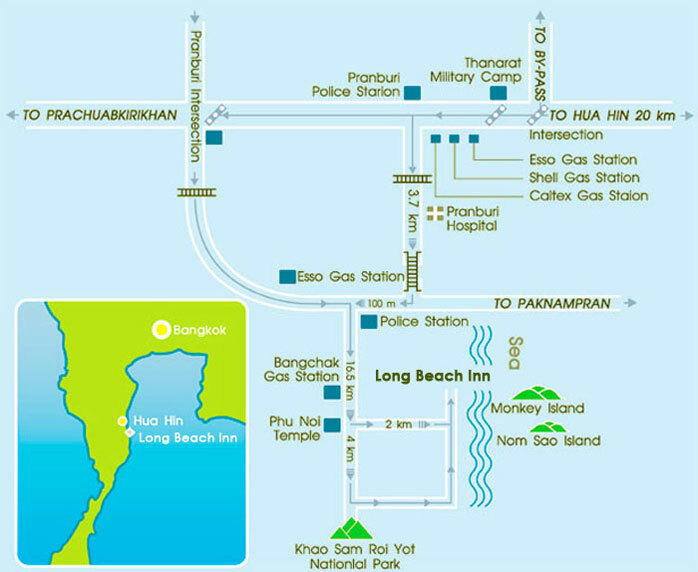 Call Long Beach before you leave and we will pick you up at the Pranburi bus station. There is also a minivan connection between Bangkok Victory Monument and Pranburi for just 180 baht.